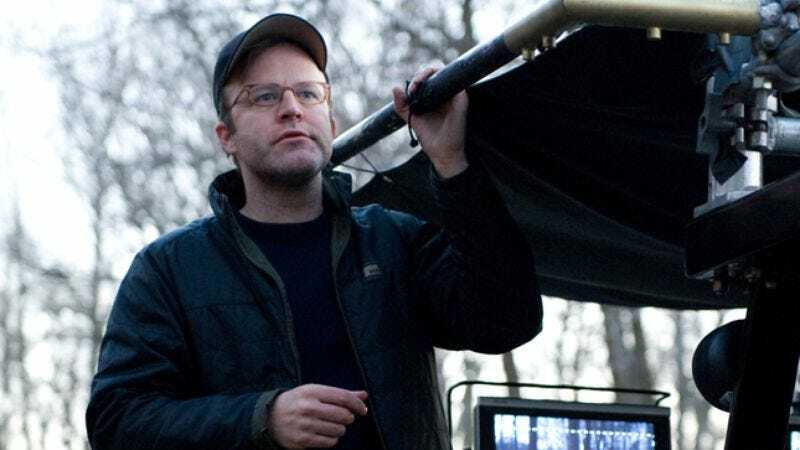 Over the course of his three writing-directing projects, Tom McCarthy has quietly built a reputation as an actor’s director. From the misfit trio of Peter Dinklage, Patricia Clarkson, and Bobby Cannavale in 2003’s The Station Agent to Richard Jenkins and Haaz Sleiman in 2007’s Oscar-nominated The Visitor to Paul Giamatti, Amy Ryan, and Alex Shaffer in the new Win Win, his quiet dramas have served as rich showcases for performers who want to sink their teeth into complicated, naturalistic roles. It’s likely that his own multi-decade acting career gave him a firm grasp of the types of roles actors regard as rare, challenging, and exciting: Starting in the early ’90s, he took a number of small film roles and one-shot TV roles on the likes of Ally McBeal, Spin City, and Law & Order: SVU. He eventually graduated to a more regular part on Boston Public (playing the same character, fired football coach Kevin Riley, in a crossover on The Practice), and later appeared in the fifth season of The Wire as ambitious, story-faking Baltimore Sun reporter Scott Templeton. Over the past few years, McCarthy has kept particularly busy, taking roles in Little Fockers (reprising his Meet The Parents role), 2012, Fair Game, The Lovely Bones, and more, while also taking time out to collaborate on the script for Pixar’s Up and direct the first draft of the pilot for HBO’s Game Of Thrones. All this in addition to co-writing and directing Win Win, the story of lawyer Mike Flaherty (Giamatti) and his wife Jackie (Ryan), who take in troubled teenager Kyle (Shaffer) after Mike makes an unethical, profit-driven decision regarding Kyle’s grandfather. The day after a Chicago screening of Win Win and subsequent Q&A, The A.V. Club sat down with McCarthy to talk about casting his movies as he writes them, walking away from Game Of Thrones, partnering with Pixar, and learning to trust actors by being one. The A.V. Club: This is your third film as a writer-director that’s specifically about artificial families—unrelated people coming together to form their own impromptu support units. What about that topic interests you? Tom McCarthy: I don’t know. I do think with this one, I was actually starting with a real family. [Laughs.] So maybe that’s what I was trying to do differently here—that I was dealing with a man who was very involved with his family, with his life, with his community, and that was a different jumping-off point than my other movies. I really wanted to work from the inside out on that, because it’s a funny thing about writing, sometimes you’re telling a whole story and someone will say, “I wonder what it would be like from that perspective” and you’re like, “Oh, wow. That would have been interesting, if I took that perspective.” I think that’s what I was trying to do with this story, bring an outsider in who also had a family, but wasn’t a functioning family, in terms of Kyle and his mother. And I think the rest of that community is all very connected. So I feel like I was, as a jumping-off point, more concerned with the responsibilities that come with being so connected, being in many ways at the center of the community, which Mike is. I think [Mike’s friend] Terry says off the cuff at one point, “C’mon, you’re the pillar of the community.” And I think he means that. I think he looks at his buddy, it’s like everyone knows him in town, he’s a lawyer for just about everybody’s parents, he deals with a lot of personal issues, and he’s seen as a guy you can rely on. What happens when that guy betrays the trust of that community? That’s the drama in movies and plays that goes way back, and that I find really compelling. AVC: There’s a lot more conflict and drama in this film than in your last two films, and a lot more underlying tension. Are those things you’re becoming more comfortable with? TM: I realize it’s a good thing. [Laughs.] It helps in driving the story forward. I think with The Station Agent, I got lucky. There wasn’t a bad guy. There really hasn’t been a bad guy in any of my movies, even in this one, even with Kyle’s mom, who probably comes closest to that. But I’m glad you say that, because I do think this is my funniest movie. As someone said at [last night’s screening and] Q&A, “There’s so much laugh-out-loud humor, did that surprise you?” I was like, “God, I hope not!” But I think that’s true, and that’s great to hear, that an audience is connecting to the film, that they’re responding in that way. That said, I think there is a real dramatic turn in this movie, and a real tension, because you watch a pretty decent guy do something very, very questionable, and then you have to live with him as he lives with that and how he compartmentalizes that, how he allows himself to forget that at times. A lot of good things emanate from that decision, but unfortunately, they’re built on a false premise, and that was very interesting to me. AVC: Kyle is in the process of actively rejecting his biological connections, which again with the theme of artificial family, comes across as striking. Do you think there is any kind of intrinsic value to biological family? TM: Yeah. I think, in fact, when she walks away from him in the courthouse, that is not a celebratory moment. I think being rejected by his mother in that sense, even if she seems to feel she’s doing what’s best for him—which, quite honestly, she probably is—it’s a very selfless act. I think he understands that that is an incredibly bittersweet moment, that is still letting go of something that we all need on some level, something so primal, it’s hard to account for. I see it all the time with people, friends who can’t stand their parents, but there’s still such a connection there. It’s not just how their parents treated them, they just can’t reconcile the fact that they’re so angry at this person who they want to love, and that, I find incredibly compelling. I think that’s something Kyle deals with in this film, that this is a woman who has repeatedly let him down, repeatedly misled him. How many times do you get burned by someone before you learn? Especially someone you love. AVC: As far as looking at different perspectives goes, this story doesn’t seem to be about one person so much as the connections between them. Just when it seems to be a story about one character, you shift and end up watching somebody else. Was that balance between characters strictly in the script? Or do you shoot more than we see and work it out in the editing room? TM: I don’t have the capacity to shoot a lot more than we see. I’m pretty economical with how I approach my films, for financial reasons. That doesn’t mean that in the edit room, that doesn’t shift sometimes, because I realize, “I don’t need to spend time with her.” For instance, I shot a scene of [Kyle’s mother] Cindy going to [her father] Leo’s house for the first time. We keep hearing about it, but we never actually see her in that house. I shot a scene early on where she goes in there for the first time and walks through the house, and you get the sense of a woman revisiting a place that had some painful memories. It was a really beautiful scene, it just didn’t feel like that was the right time to go there with her, which was too bad, because I really liked the moment a lot. As a writer, I thought, “Oh, that’s funny.” Now seeing it realized, it doesn’t feel like where we want to be. We want to be with Kyle and see what’s happening to him right now, or with Mike, seeing him get the news on something. So there are moments that change and shift because I am dealing with a number of different threads and characters. It’s finding that balance that’s a constant challenge. Editing becomes a big rewriting process for that reason. AVC: You’ve said in the past that you cast your films mentally while you’re writing them. Did you do that here? AVC: Has that ever backfired? Have you ever written for someone you had in mind, and been unable to get them for the film? TM: Yeah. [Laughs.] It happened for this role, with the role of [Mike’s assistant wrestling coach] Vigman. I had someone else in mind, and then they couldn’t do it. There was a conflict, which was too bad. AVC: Can you say who that was? TM: No I’d rather not. But it made me think about the role, and then it took about two weeks, and the minute I thought of [Jeffrey] Tambor, that was it. But it really didn’t change the role much. He connected with it. I spent some time with Jeffrey and started to adapt it, and the role quickly became his. Plus, it happened during pre-production, so my mind was somewhere else. It was almost like I had to stop and focus on something that I thought was finished. Every day in pre-production is a checklist, and when you have to put something back on your checklist, when time is tight, which it was a bit in our pre-production, that could cause some anxiety, so I had to recalibrate for a moment. In this case, it really worked out. I just know it definitely stopped me for a moment, and taught me a lesson. But it also taught me that good writing can solve those problems, because there’s flexibility in there. AVC: How far down the cast list does the process go? Are you casting all the roles in your head, or is it just your leads? TM: It varies. It normally starts with the leads, with the big characters you’re spending most of your time with. But if I have someone in mind, I’m like, “Oh, I know who can play this. I’ve just got to ask them.” And I know actors at all different levels of their careers, and some will do smaller parts, and some will jump in. Sometimes it varies, and sometimes I don’t think about it, and I’m like, “I’m gonna wait and see…” because I’ve worked closely with my casting director on all three films. And sometimes I see who his recommendation is and see how that ignites me focusing on that role again. Like, sometimes you see a part and you’re like, “Oh my God, that’s really good. If I use her, you know what I can do…” So it really varies quite a bit. AVC: You’ve said with your films that people connect with the characters so much that it’s pretty common for people to stand up at Q&As and ask, “What happens to this character afterward?” Have you been getting that with this one? TM: Yeah. Happened last night. AVC: Do you have a mental idea of where any of the characters in any of your films go after the story? TM: Sometimes, but I don’t make it a point to map that out, because I would be afraid of working to that goal. Sometimes I just like to get them to a place. [Story collaborator] Joe [Tiboni] and I laughed sometimes, like, “Man, it’s going to be tough for Mike for a while… Come spring, [Mike’s young daughter] Abby is gonna have to get a lemonade stand and jack up prices to about $50 a glass to try and bring in money.” We talked about all the different options for making money, and what that meant, and how long Kyle would stay there. And then we were like, “What if we came back 10 years later, and he was still living in the basement at age 30?” [Laughs.] Now their thing is getting him out of the house, because he’s the son that won’t leave. But I don’t seriously contemplate that. I think I’ve done my job if the audience is thinking about that, worrying about that, or wondering about that. AVC: How do you answer them when they ask those questions? TM: I honestly don’t have the answer. If I had something really concrete, or a really great guess, I might, but even then, I probably wouldn’t. But I remember with The Visitor, people just wanted to know if Mouna and Walter ever got back together. I remember Peter Travers was hosting a Q&A for me in New Jersey, and this one woman would not let it go. She had to know why wouldn’t they see each other. “Couldn’t they meet in London?” And I was like, “Yeah, that would be lovely, actually.” I loved it, and [Travers] was cracking up. He probably had to talk her off the edge, because she wouldn’t stop asking the question, but he was also like, “This means the movie is sticking with you a little bit.” And if that’s happening, then I feel like I’ve done my job at least. AVC: You’re still working as an actor. How do you pick your roles these days? TM: I think at first, I look at the project, see if I like the script. That’s always a jumping-off point. Then the character, obviously. Sometimes I’ll do it if I really want to work with a director. Sometimes it’s for money, honestly. If I think, “Oh, I can go make some money and have fun with this and learn something,” I’ll do that too, because I don’t get wealthy making movies like this. I shouldn’t complain—I consider myself very fortunate. But you have to figure out a way to round out your salary in the year sometimes, like we all do with different jobs. But I think like every actor, there are different reasons to take jobs. Sometimes they’re practical, sometimes they’re purely artistic, and sometimes they’re opportunistic in terms of working with someone who you’re excited to work with, or just a role like, “Wow, I’ve never done anything like this. This is really disturbing, or really exciting, or just really different.” Like any actor, I guess. I guess the difference is, I do other things now, including writing to make money, and making my movies, so I’m a little more picky. There has to be a strong reason, or I won’t do it. I won’t do it just to do it. If you’re just acting, sometimes you’ll just act because that’s what you do, and if you’ve gone too long, you’ll start to get that hunger. AVC: What’s it like going from making these small, intimate, nuanced family stories to being in Little Fockers? TM: [Laughs.] It’s pretty easy, because I love acting. When you’re just an actor on set, it’s such a joy, ’cause you’re there to do one thing. Fockers was great. It was odd, actually, because it was 10 years earlier that we made Meet The Parents—I wasn’t in the second one—and suddenly we’re all back in that one, and it felt very, very odd. But in a fun way. Ben [Stiller] and John Hamburg and Jay Roach, those guys have all become friends of mine. It’s just a wonderful opportunity. They wrote one scene, so why wouldn’t I do it? It’s fun to be on set for the day. AVC: Do you think that other directors or actors treat you differently given that you’re a successful writer-director? TM: I think they should. I think that needs to start happening. [Laughs.] I don’t know. Probably. I think because I have directed movies, maybe I have a little bit of a different rapport with some directors, because there aren’t that many of us, quite honestly, and they know there are things they can talk about that some actors might not fully understand, because it’s not their discipline. I think actors also know, as a director, that I’ve been an actor for a long time, and I’ve had good and bad experiences as an actor, and I understand them a little bit more. I sometimes attribute it to be being a player-coach. When a player moves up to being a coach, I think players, if they know—“This guy, he’s walked the walk, he’s played, he knows what it feels like, he knows the ins and outs of it.” There’s a little bit of respect there—trust is maybe a better word than respect. Maybe they’re linked. I feel like acting is sometimes like waitering. I feel like every director should have to do it to know how vulnerable that is, know what it really feels like, know why actors don’t want to be shown how to do something. They’re not just being problematic; it really gets in the way of actors’ process if you’re like, “Can you just do it this way?” And they’re like, “No, I can’t do it that way now, because I’ll just be doing what you did, and it won’t be real.” So I think that has helped. But you still have to just do your job, whichever job that is. So I think ultimately, that’s how people are judging you, not on any preconceived notion of who you are. I hope. AVC: Have you learned specific things from watching other directors during acting jobs? TM: Absolutely. I think every set I’m on, I take something away, and sometimes it’s good, sometimes it’s bad. Sometimes it’s like, “Eh, that doesn’t work,” or “Oh wow, I love the way he talks to his cinematographer, I love their communication,” or “I like the way he deals with an ensemble scene, I like the way he keeps it light,” or “I like the way he blocks this scene,” or “I don’t like the way he blocks the scene,” or “I like the way him and his AD work together,” or “I like the way he schedules his day.” It’s always something, like, “It’s helpful to have the writer here on set.” There are so many things to learn when you’re on a set, and it’s the great advantage of being an actor now, because not only am I watching the process, I’m involved in it when I’m on set with another director. That’s different from just visiting the set as an outsider. Not that you can’t pick things up that way, but when you’re really involved in the process, you’re in the conversations, you’re involved in the development of a scene, and you’re participating, so obviously you’re learning more. AVC: What’s the worst advice you’ve ever been given about directing? TM: [Laughs.] Hmmm… you have absolutely stumped me. There’s not one that comes to mind, because that would mean I’ve had to work with a real idiot who’s giving me advice, and I haven’t. Advice doesn’t come from everybody, and I think most of the people I’ve worked with—it’s me asking for advice first. I’m sure there were probably one or two things where I shook my head and thought, “Well, I’ll probably never do it that way,” but I can’t really think of one right now. AVC: That question came to mind because I ran across a quote in another interview where you talked about how you’ve blurred the lines of how people have told you directing is done. You prefer to cross those lines and work with people in different ways than conventional wisdom says you’re supposed to. TM: Speaking to that, that was never advice, that’s just sort of process. I feel like people really maintain a division of labor—you bring your editor in here, the actors start working on this date. If I had to generalize, I have the feeling some directors don’t love working with actors. I think they feel like they need them, and they need to get something out of them so they can complete their vision, but they don’t have a lot of patience for the process or craft of acting, and for what a good actor can bring to a role, and how much better an actor can make a scene. Because the director has a really strong vision—and I’m not taking away from that, but I think really good actors, not every actor, but a lot of actors, can bring a lot. And that is an example of somewhere where I will allow input and encourage it, and push my actors. I think at first, Paul [Giamatti] and Amy [Ryan] were reticent. They’re such conditioned actors, and they’re so willing and able to tackle anything that’s put before them. I was asking for a little bit more at times, like input, like feedback, and I don’t think they were used to that. Like, “C’mon, really, how do you feel about this?” The problem is, they’re such facile actors, they can make anything work. The problem is working the best that it can, and sometimes you demand a little bit more. And sometimes not. Sometimes the scene is good and we just rehearse it and do it. AVC: Have you often been given that kind of input yourself as an actor, into your role and how you want to play it? TM: No, The Wire was plug-and-play. The Wire was such a well-oiled machine, and those guys had that world so well-defined at that point that I would get the script, learn my lines, put on my costume, and go to work. It was effortless, because it was so well orchestrated and so strong. AVC: Did they seek you for that role? TM: Yeah. I guess I read for the first season when they were setting it up, which was years earlier. And then I forgot about it, because I started to do other things, I was directing. And then going into the fifth season, Simon remembered me for that role, or someone did, because they offered me the role. Initially, I didn’t turn it down, but I didn’t think I could do it, because I was editing The Visitor, and I was very busy, and I didn’t think I could give it my attention. Finally, David called me one day and was like, “Hey it’s David Simon. I’m in London, I know you’re a little back and forth, but I think it’s a really good idea, and here’s why.” And he had a two-minute “I think you should do it,” and didn’t say much more. I was like, “That’s good enough for me.” So I just said yes and jumped in. But honestly, the first two months were brutal, because I was working seven days a week between editing and finishing a movie and doing The Wire. It was a good lesson for me, because they were two jobs where I loved both of them, and was very proud to be associated with both those jobs, but it was hard to enjoy either of them, because there was no break. So that taught me a lesson about managing my time and managing jobs, and that kind of thing. AVC: You directed the pilot for HBO’s Game Of Thrones. How much input did you have into that, in terms of setting the look or the cast? TM: Very little. I did a lot of the casting. I think we did some good work. But they’ve had to reshoot and rethink so much of it since I left, and I’ve had no involvement in that, because of Win Win. I finished that right before Thanksgiving and went into Win Win over the holiday, so I literally had a week or two of downtime. I turned in an early cut, and they had to recast, and I think they rethought… You know, they’re taking on this huge book, and they rethought how to get into it and how to set it up. They had to change some locations, and they did quite a bit of work on it since I left. I’d like to think I had some impact on it, but I don’t think much of that is mine anymore. TM: I’m actually not gonna have my name on the pilot anymore. The guy who did the second episode, when they were doing all the re-shoots, he took on the first. I couldn’t do it. And I just didn’t feel connected to it. It wasn’t a big decision. It felt right. It felt like more of it was his than mine in terms of what you see on the screen now, and I think if you would talk to them, they would say I was helpful in a lot of the process, but it certainly doesn’t feel like mine. It’s really not a director’s medium. I think there are some really good TV directors, but that is a writers’ medium and a studio’s medium. There was a good learning curve on that, but I don’t think it’s anything I’ll rush back to. AVC: Do you have any interest in being involved in the series going forward at any point? AVC: What interested you about it in the first place? TM: It came at a time when I was between things, and I like Dave [Benioff] and Dan [Weiss], the creators, and I never had done anything like it, and I think that challenge was interesting. But I think if you’re going to do series television on any level, and if you want to enjoy it, you really have to understand the parameters of what you’re doing, and have your team in place, and have your support network. I think the great shows, The Wire, Sopranos, Six Feet Under—I think there was a very clear understanding of whose show it was, and I think those guys who made those shows, there was a singular vision there. I think that show can get there, I just think it was hard for me, not being so involved. I finished it and walked away, and I’ve never done that with anything. I’m a perfectionist and I like to be involved. Sometimes it takes time for people to understand what you’re doing with a series or with a film. Even through rough cuts, they don’t see it. I think with Win Win, early on, people were surprised at how funny the movie was, and the audience reaction. I know the studio was. They weren’t sure, and then we did our first test screening, and it scored very well, and our audience was obviously very involved. And Searchlight got very excited at that point—you could sense it. They’re like, “Okay, this movie has heart, and it’s making people laugh.” The next day, we had a meeting, and they were just like, “Great, what do you need? How do you get to finish this?” And we were like, “Whew!” because then we were allowed to go finish the movie the way we wanted to, and the whole partnership has been really smooth. TV is not quite like that, because it’s the writers, and the directors are more there to serve their vision. It’s a different thing. I learned a lot from it, I’m really glad I did it, and I think I was successful with some things and not with others. I liked a lot of the people I worked with, I worked with some really talented people on that project. But it felt a little more like a job. AVC: Was Up like that at all? You have a story credit. TM: No, Up was a very different experience. Up was a fantastic experience for me. I’m going out next week to see those guys to show them Win Win, so obviously…. It was the same kind of thing. [Co-director] Pete [Docter] needed a writer, because his writer was on something else; they were just starting to take people in from the outside at that point. I was there, Michael Arndt was there working on Toy Story 3 around that time. I went there to screen Station Agent, that’s how we met. We chatted, we had a nice lunch, I thought it was just that. Then a couple weeks later, he came to New York to sit down with me to show me the story, and he showed me some images of the house floating away with balloons, and I thought, “Cool.” And he asked me if I wanted to come out and help develop the movie with him. Then through the channel of business, we figured out that I would go out for three or four months, turn in a couple drafts, and then move on. I couldn’t commit like Michael, who has been there the whole time—it’s his screenplay. I couldn’t do that. I wanted to go make my next movie. I didn’t want to spend two or three years writing a movie for Pixar. But I had a great experience, did a couple of drafts and kind of stayed involved. I stopped in to see cuts and give notes and talk to them about things. I felt always very connected to that, even though that process went on forever. I mean, when I left there, I conceived, wrote, directed, and distributed The Visitor, and Up came out a year later. That’s crazy. That’s how long that took. I couldn’t be prouder to be affiliated with that. They make great movies like that for a reason. That is a super well-run studio. TM: I’m writing something for Disney right now. I usually take on a writing gig or two a year. Usually just one. I’m writing a movie for them right now, which is a lot of fun, I’m enjoying digging around with it. And I’m starting my next film. I’m developing a story with another writer that I think is really promising, but it’s still so early. We haven’t had much time because of this. This whole process of Win Win is pretty compact. We started shooting a year ago March 15, so it was like working straight through, and now this movie’s coming out, which is great. I like that. It’s immediate. Sometimes you sit around for a while. So it’s nice to get it out of the way. I think I gotta get through this little press tour, and then I’ll have a little more time. AVC: From the perspective of someone who doesn’t see what you’re doing on the back end, it doesn’t seem like a compact process, it seems like three or four years between your films. Is that just because you’re doing so many other things? AVC: So do you think it’s going to be three or four years until we see this next film? TM: I don’t think so, but it could be. It takes a while. If you have a script, it takes a year or so to get a movie out. I said compact in terms of… Let’s see. I started writing this about two years ago, but I started pre-production last January/February, we started shooting March 15, from pre-production to the movie coming out… That’s compact for me, because that never happens that quick. Part of that was because the studio was like, “We like the movie. We should be able to finish it, and we can do it at Sundance, and we should roll it out after that.” And we were like, “Great! That sounds good.” And they were right. It’s a good time of year for the movie, I think it’s the perfect time of year, and I think Sundance was a great launch for it, because it plays for that audience. We’re taking it to South By Southwest; I think that will be a good place for it. It just feels like the right release strategy for the movie. So we shall see.